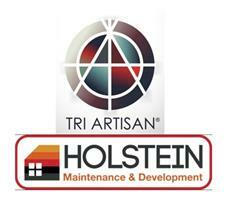 Holstein Maintenance & Development (Tri Artisan brand) - Builder, Damp Proofer based in Cleasby, North Yorkshire. Holstein Maintenance & Development provide the complete building and property maintenance package. From design and sourcing through to installation and future maintenance, we do it all. Whether its for fixing leaky taps to large scale renovations, our commitment to distinctive workmanship and unparalleled quality is at the heart of all we do and well illustrated by our track record of successful projects over many years. Our first priority is always to deliver what we promise. This means we employ a hand-picked team of seasoned craftsmen, because we understand that the success of a new project depends on the talent and dedication of the people whose job it is to deliver. Within the wide compliment of trades we have available, we are the ‘go to’ leading experts for Dampproofing e.g. structural waterproofing and condensation control. Preservation and Restoration. Our complete offer to our clients is the most comprehensive and price efficient way to develop, safeguard and service your property, because you will not need worry about added costs and quality of workmanship from having to liaise across several companies. We take care of all your needs. Wherever we work we put stringent procedures in place to ensure that all our construction activity and related services are completed with the highest possible standards of safety in mind. Furthermore our reputation also comes from giving a thorough clean-up, leaving properties better than we found them, because things like attention to detail matter. Holstein Maintenance & Development give all our clients, large and small, 5 star workmanship, affordability, super reliability and a level of personal support that large companies struggle to maintain. This is because we know our work acts as our best recommendation and we want many more satisfied customers who will happily come back to us time and time again. Holstein Maintenance & Development are here to serve - work is our life.